Better It With Benefiber Cook-Off and a Giveaway! 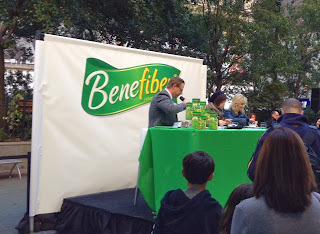 This post was sponsored by Benefiber®. The opinions expressed are my own based on my experience. When a representative from Benefiber® contacted me to see if I would be interested in a friendly cook-off with two other chefs utilizing the fiber additive in breakfast dishes to be held in the pedestrian walkway of Herald Square in NYC (right outside of Macy’s), I was thrilled. 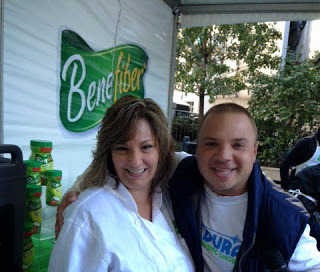 Myself, along with fellow food blogger Susan from Girl in the Little Red Kitchen and Justin Mazzola, a NYC restaurant chef, were to create three recipes and incorporate Benefiber into our sample plates that were going to be evaluated by three judges; who unbeknownst to me at the time were Top Chef: All Stars winner Richard Blais, Krysta Rodriguez, who plays Casey in the Broadway musical First Date; and Elisa Zied, a registered dietitian, author, and freelance food and nutrition writer. 4:30am I woke up and got ready for a 5:30am ride into the city. We had to be there by 7am and even though I only live 45 minutes outside of the city, drive on Rte. 3 after 6am and it is bumper to bumper traffic! Thankfully we sailed into the city with no problems and I arrived by 6:15am. 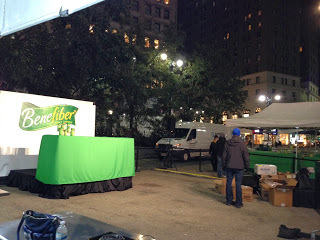 The event company was fast at work setting up and staging their area to hand out mini muffins to the people passing by. 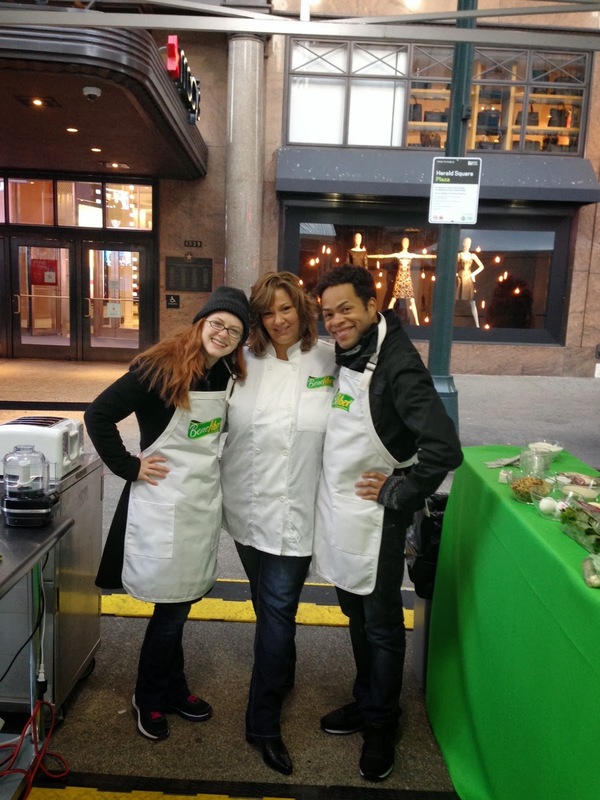 And here I am with my two friendly competitors, Susan and Justin. 8:00am Our stations were set up and we we were all ready to go. I would be making three dishes for the judges and placing samples of each of the recipes on one plate. Ok…REALLY bad picture alert coming up next! (I think that the 4:30am wake up call didn’t do any wonders for the bags under my eyes). 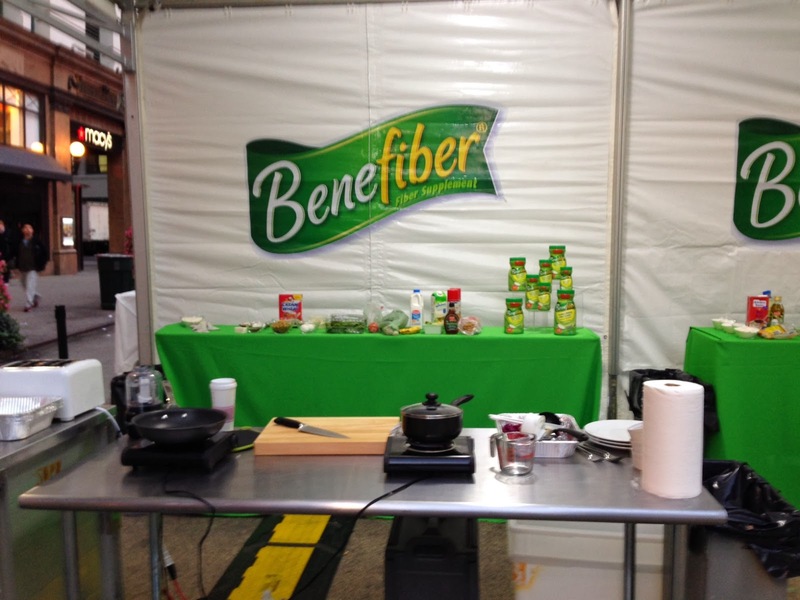 Anyway…Benefiber® was SO easy to add to my dishes. I added Benefiber to the milk while heating it up for the Cream of Wheat®, and I whisked it into the eggs and scrambled them with a fork before cooking. The superfine powder dissolved easily and wasn’t gritty at all. 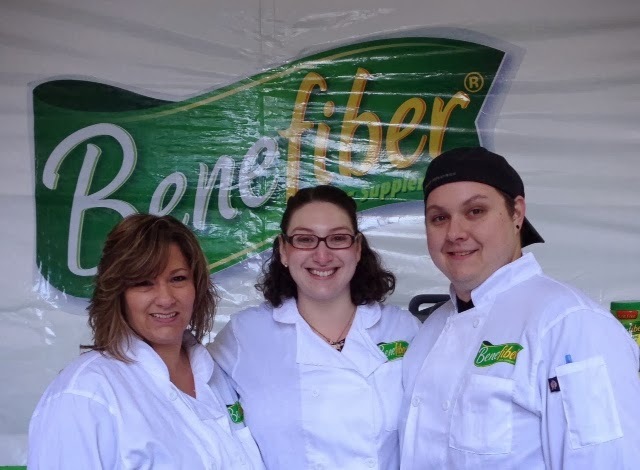 If you aren’t getting enough fiber naturally through the foods you are eating, try adding Benefiber to your everyday recipes. By 9:20am, all three of my dishes were ready to go into the warming box waiting to be presented to the judges. Then I heard a familiar voice as a man worked his way behind the work tables with a microphone. Greg T the Frat Boy from Z100’s Elvis Duran and the Morning Show had worked his way in behind our workspaces to cover the story. If you’re not familiar with the station, they play Top 40 music and with one teenager and one preteen in the house, the radio is no longer mine when they’re around and this is their station of choice. This one is for my girls; who were very jealous btw. Now for the moment of truth. The judges sampled all three of our dishes, loved each and every one of them and they were ready to announce the winner. 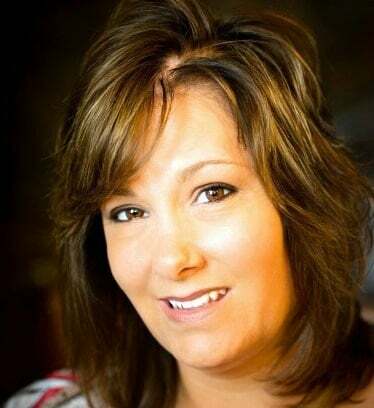 And the winner is….Carrie Farias! I WON! I couldn’t believe it. 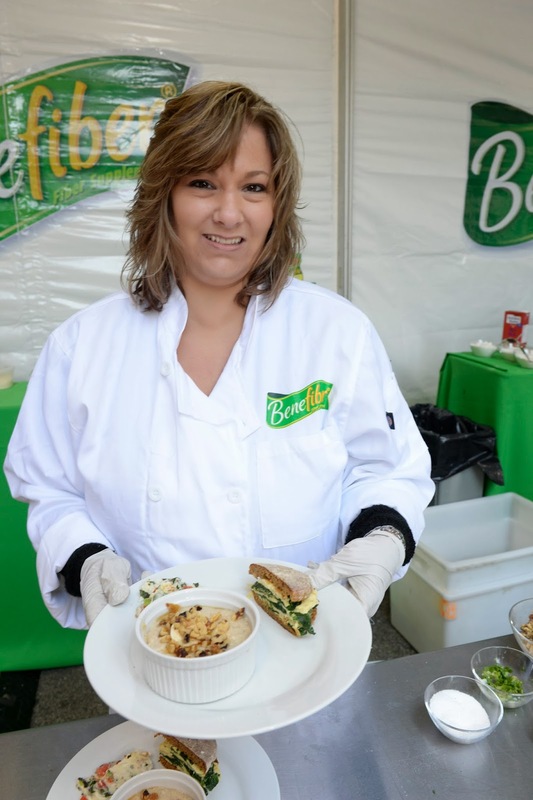 My dishes were much simpler than my competitors and I was questioning myself the entire time. Maybe I should have been more elaborate or creative. But simple, easy to recreate at home recipes is what I’m about here at Carrie’s Experimental Kitchen so I went with what I know. Good food is good food, no matter how simple it is to make. Thank you to everyone involved in the days’ events including Tessa, Michael, and Ally from the PR and Event Companies; as well as the many workers that helped put this successful event together. It was a really fun day and a great experience! Not only did I win, but I also received a lovely basket with Sur La Table kitchen utensils, Richard Blais’ new cookbook Try This At Home, and a $100 Gift Certificate to Sur La Table; which as much as I love to shop for kitchen gadgets…I love you guys more! 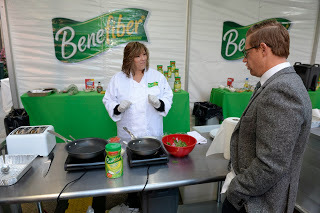 Enter the giveaway through the Rafflecopter below and tell me what food or drink will you be adding Benefiber to and you can go shopping for YOUR favorite kitchen gadgets! *Contest valid 10/29/13-11/3/13 to U.S. RESIDENTS ONLY. Winner will be notified by 11/04/13 and will have 48 hours to respond. If the winner does not respond within that time frame, another winner will be selected. I’m going to try it with cream of wheat!!! So glad you won, Carrie! I would add it to orange juice. My cereal, soup, oatmeal, coffee, anything?